MOSCOW - Police clashed with demonstrators protesting alleged election fraud in Moscow and at least two other major Russian cities on Tuesday as anger boiled over against strongman Prime Minister Vladimir Putin and his United Russia party. At least 250 people were detained by police at a protest in downtown Moscow that included flare-type fireworks thrown at a group of pro-Kremlin youth, said city police spokesman Maxim Kolosvetov. An Associated Press reporter saw at least two flare-type fireworks thrown into a crowd of pro-Kremlin demonstrators gathered outside the Tchaikovsky Concert Hall on Tuesday night. It was not immediately clear who had thrown the devices or if they caused any injuries. The demonstrations follow Sunday's parliamentary election, in which United Russia lost a large share of the seats it had held in the State Duma. The party maintains a reduced majority, but opponents say even that came because of vote fraud. Putin: Drop in support for party "inevitable"
In neighboring Lithuania, U.S. Secretary of State Hillary Rodham Clinton again criticized the Russian election and urged that widespread reports of voting fraud be investigated. The protesters appear to be both angered by the reported fraud and energized by the vote's show of declining support for Putin and his party, which has strongly overshadowed all other political forces in Russia for the past dozen years. Several hundred young men with emblems of United Russia and its youth wing had gathered with police at Triumphal Square in the city center ahead of the planned opposition rally. Police waded into several groups of opposition supporters, pushing them away from the square  roughly grabbing many and throwing them into police vehicles. Detainees included prominent opposition leaders Boris Nemtsov and Eduard Limonov, but Russian news reports said both were released from custody late Tuesday. 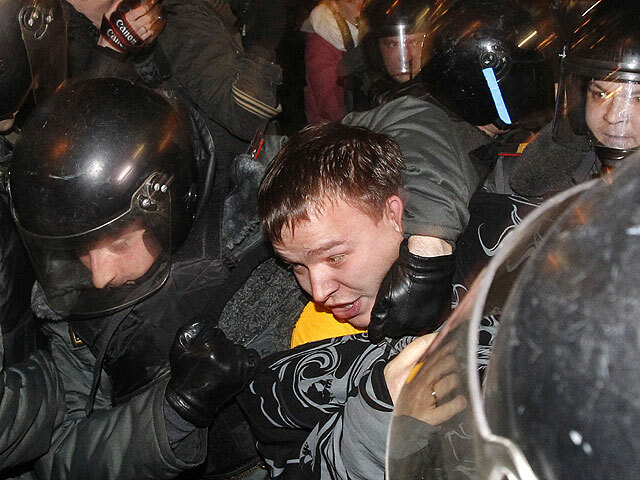 After the protesters were pushed back, they and government supporters shouted at each other  "Shame, shame" was the call from the opposition, while the others, some of whom beat drums, shouted "Putin victory." Members of the pro-authorities group gravitated toward the nearby Tchaikovsky Concert Hall, continuing to chant and bang drums. Then at least two flare-type fireworks were thrown into their midst. It was unclear who threw the devices or if anyone was injured. The confrontation lasted more than three hours before pro-government youth began leaving the area. About a half-mile away, around 100 demonstrators chanting against Putin held a short march from the U.S. Embassy toward the Russian White House, but scattered when police arrived in buses. United Russia won slightly less than 50 percent of Sunday's vote, according to nearly complete preliminary results. Although that gives the party an absolute majority in the State Duma, the lower house of parliament, it is a significant drop from the 2007 election when the party got a two-thirds majority, enough to change the constitution unchallenged. Sunday's election results reflect public fatigue with Putin's authoritarian streak and with official corruption in Russia, signaling that his return to the presidency in next March's election may not be as trouble-free as he expected. Putin, meanwhile, called his party's reduced number of seats in Sunday's parliamentary election an "inevitable" result of voters always being dissatisfied with the party in power. He also dismissed allegations of corruption among his United Russia party members, calling it a "cliche" that the party had to fight. Russia's beleaguered opposition has been energized by the vote. Late Monday, thousands marched in Moscow chanting "Russia without Putin!" That demonstration apparently caught authorities by surprise, and police and troops on Tuesday substantially increased their visibility in an apparent effort to discourage more gatherings. Police detained about 300 protesters in Moscow on Monday and 120 participants in a similar rally in St. Petersburg. Two of the Moscow rally's leaders, Ilya Yashin and Alexei Navalny, were sentenced to 15 days in jail Tuesday. Putin's comments Tuesday appeared to aimed at saving face and discouraging the opposition from seeing United Russia as vulnerable. "Yes, there were losses, but they were inevitable," Putin said at a meeting of party supporters. "They are inevitable for any political force, particularly for the one which has been carrying the burden of responsibility for the situation in the country." Putin also rejected the popular characterization of United Russia as "the party of crooks and thieves," saying corruption was a widespread problem not limited to a single party. "They say that the ruling party is associated with theft, with corruption, but it's a cliche related not to a certain political force, it's a cliche related to power," he said during a meeting with provincial officials. "What's important, however, is how the ruling government is fighting these negative things," he said. Rodham Clinton criticized the Russian vote for a second straight day, saying Tuesday that "Russian voters deserve a full investigation of electoral fraud and manipulation." Konstantin Kosachev, a senior United Russia member, described her statement as "one of the darkest pages in Russian-U.S. relations" and warned Washington against supporting the opposition. Russia's only independent election monitoring group, Golos, which is funded by U.S. and European grants, came under heavy official pressure ahead of Sunday's vote after Putin likened Russian recipients of foreign support to Judas. Golos' website was incapacitated by hackers on election day, and its director Lilya Shibanova and her deputy had their cell phone numbers, email and social media accounts hacked. The Russian election even drew criticism from one of Putin's predecessors. "There is no real democracy here and there won't be any, if the government is afraid of the people," former Soviet leader Mikhail Gorbachev said on Ekho Moskvy radio.